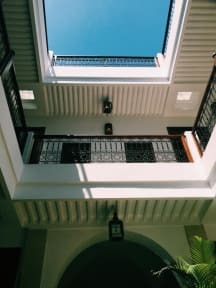 Riad 107 i Marrakech, Marokko: Reservér nu! Riad 107 is located in Marrakech medina near Jamaâ El Fna Square. It features a plunge pool and a private hammam. There is a large rooftop terrace with both covered areas and spaces to soak up the morning or afternoon sun. Rooms at Riad 107 are individually decorated in traditional style and have private bathrooms with tadelakt and tile decoration. All rooms have air-conditioning and heating. Bathrobes and hairdryers are stocked in the bathrooms. 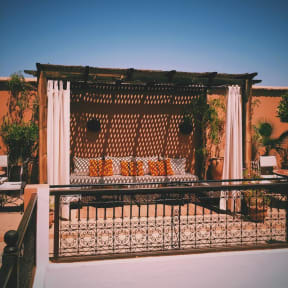 The riad also serves traditional Moroccan cuisine for lunch and dinner in the dining room or on the terrace by request. Additional facilities at Riad 107 include a tour desk and free Wi-Fi. Massages are also on offer.